In this third and possibly final part of this series (see Part 1 and Part 2), I do nothing more than serve as a repeater, amplifier, and highlighter, by presenting the materials below from Dr. Ron Paul. 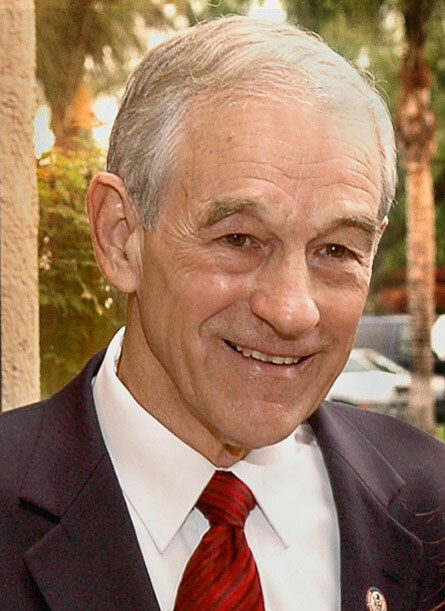 I must confess that until recently I have paid very little attention to Ron Paul, knowing that he was a Republican presidential candidate in 2008, that he has a determined following, and that some compared him to Ralph Nader. In a period where John McCain has adopted the label of “maverick,” it seems that Ron Paul stands out most strikingly as an anti-imperial Republican, a staunch critic of the invasion of Iraq and the development of the national security state, and his talks come across as unusually erudite, articulate and cultivated for someone working in a Republican framework. In many other ways, Paul remains firmly within the Republican fold, and I do not present what follows as an overall endorsement of Paul. An online collaborator was kind enough to send me the materials below, and I invite the reader to really spend time either watching the videos in sequence, or reading the transcipt that follows, or both listening and reading along. The original American patriots were those individuals brave enough to resist with force the oppressive power of King George. I accept the definition of patriotism as that effort to resist oppressive state power. The true patriot is motivated by a sense of responsibility, and out of self interest — for himself, his family, and the future of his country — to resist government abuse of power. He rejects the notion that patriotism means obedience to the state. True patriotism today has gotten a bad name-at least from the government and the press. Those who now challenge the unconstitutional methods of imposing an income tax on us, or force us to use a monetary system designed to serve the rich at the expense of the poor, are routinely condemned. These American patriots are sadly looked down upon by many. They are never praised as champions of liberty as Gandhi and Martin Luther King Jr. have been. Liberals, who withhold their taxes as a protest against war, are vilified as well — especially by conservative statists. It is conveniently ignored that the only authentic way to best support the troops is to keep them out of dangerous, undeclared, no-win wars that are politically inspired. Sending troops off to war for reasons that are not truly related to national security — and for that matter may even damage our security — is hardly a way to “patriotically” support the troops. Loyalty to the state and to autocratic leaders is substituted for true patriotism — that is, a willingness to challenge the state and defend the country, the people, and the culture. The more difficult the times, the stronger the admonition becomes that the leaders be not criticized. Because the crisis atmosphere of war supports the growth of the state, any problem invites an answer by declaring “war” — even on social and economic issues. This elicits patriotism in support of various government solutions while enhancing the power of the state. Faith in government coercion and a lack of understanding of how free societies operate, encourages big government liberals and big government conservatives to manufacture a war psychology to demand political loyalty for domestic policy just as is required in foreign affairs. The long term cost in dollars spent and liberties lost is neglected as immediate needs are emphasized. Non-violent protesters of the tax code are frequently imprisoned — whether they are protesting the code’s unconstitutionality or the war that the tax revenues are funding. A more sophisticated and less well known technique for enhancing the state is the manipulation and transfer of wealth through the fiat monetary system operated by the secretive Federal Reserve. Protesters against this unconstitutional system of paper money are considered unpatriotic criminals and at times are imprisoned for their beliefs. The fact that, according to the Constitution, only gold and silver are legal tender and paper money is outlawed, matters little. The principle of patriotism is turned on its head. We are continually being reminded that “9/11 has changed everything.” Unfortunately, the policy that needed most to be changed — that is our policy of foreign interventionism —has only been expanded. There is no pretense any longer that a policy of humility in foreign affairs, without being the world’s policeman and engaging in nation building, is worthy of consideration. We now live in a post 9/11 America where our government is going to make us safe no matter what it takes. We’re expected to grin and bear it and adjust to every loss of our liberties in the name of patriotism and security. The erosion of our personal liberties started long before 9/11, but 9/11 accelerated the process. There are many things that motivate those who pursue this course — both well-intentioned and malevolent. But it would not happen if the people remained vigilant, understood the importance of individual rights, and were unpersuaded that a need for security justifies the sacrifice of liberty — even if it’s just now and then. The war mentality was generated by the Iraq war in combination with the constant drum beat of fear at home. Al Qaeda and Osama bin Laden, who is now likely residing in Pakistan, our supposed ally, are ignored, as our troops fight and die in Iraq and are made easier targets for the terrorists in their backyard. While our leaders constantly use the mess we created to further justify the erosion of our constitutional rights here at home, we forget about our own borders and support the inexorable move toward global government — hardly a good plan for America. The accelerated attacks on liberty started quickly after 9/11. Within weeks the Patriot Act was overwhelmingly passed by Congress. Though the final version was unavailable up to a few hours before the vote –– no Member had sufficient time to read or understand it — political fear of “not doing something,” even something harmful, drove Members of Congress to not question the contents and just vote for it. A little less freedom for a little more perceived safety was considered a fair tradeoff — and the majority of Americans applauded. Before the war in the Middle East spreads and becomes a world conflict, for which we’ll be held responsible, or the liberties of all Americans become so suppressed we can no longer resist, much has to be done. Time is short but our course of action should be clear. Resistance to illegal and unconstitutional usurpation of our rights is required. Each of us must choose which course of action we should take — education, conventional political action, or even peaceful civil disobedience, to bring about the necessary changes.